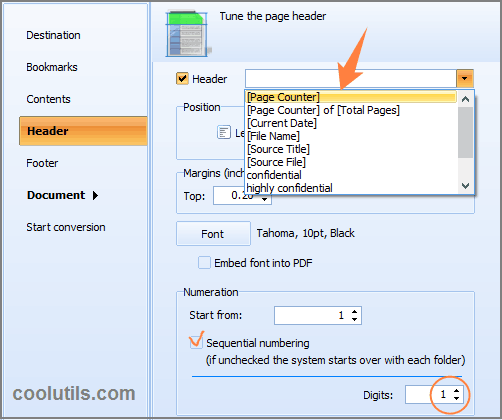 Page numbers improve navigation within your PDF file. 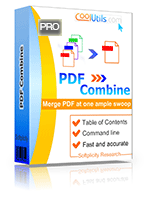 With PDF Combine Pro users can merge all sorts of file types into a single PDF. Imagine you have several files that you want to combine but each of them is a different format (PDF, DOC, TIFF, XLS, HTML). What do you next? That’s where we can help by removing the difficulty from your conversion projects. Our combine tool is capable of merging just about any format and it’s loaded with great options. For instance – the PDF Combine Pro lets you add page numbers to your documents. An important feature for any professional PDF, page numbers organize content and allow readers to quickly jump to the section they need. 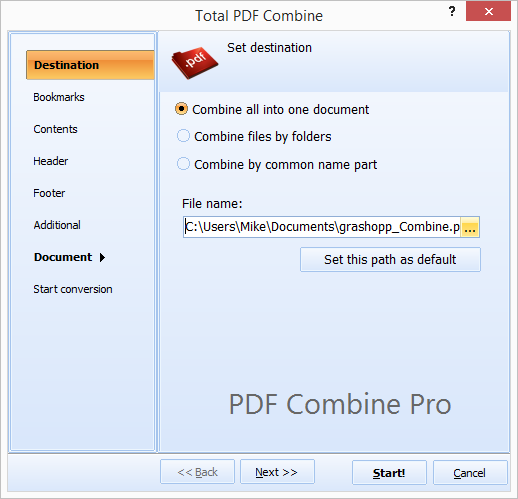 Start PDF Combine Pro and locate the folder(s) containing the files you’d like to combine. Supported file types include PDF, HTML, DOC, TXT, RTF, XLS, XLSX, TIFF. JPEG, PNG. Then add a check mark beside each file in the FileName frame that you want to include (or press Check All button below the list of files). Once you’ve added a check to each of the files you want to work with click Combine to PDF in the upper left-hand corner. This takes you to the options window where you’ll see a list of customization links on the left. By clicking Header you can access the Tune the page header interface. Here you will see a number of options that let you define how your documents header will display. In order to add page numbers check the box next to Header. Click the arrow on the right-side of the Header text field to reveal the dropdown menu. Next select the counter macro. Your finished PDF document will now include page numbers! There are two macros for your page counter. First, you may select [Page Counter]. In this case your pages will get only numbers (01, 02, 03). If you would like to know the total number of pages, use [Page Counter] of [Total Pages] macro. In this case your page numbers will look like 01 of 25. Note that you can set the number of digits from 1 to 10. Unused digits will be replaced with zeros. Are you an advanced user looking to work directly with the command line? Look no further! You can skip the GUI if you prefer. In addition we provide a variety of customization options to help you take your PDFs to the next level. Custom headers and footers (a page counter, a date, confidential stamp). Th eoption of creating non-searchable PDFs or PDF/A. Document encryption and user permissions. Document information (author, keywords, subject, and title). And so much more. We’re certain that once you’ve tried the PDF Combine Pro you’ll agree it’s a truly powerful and unique tool.